Shoah march offices used for political activity? The mood on Holocaust Remembrance Day was both somber and heartbreaking. 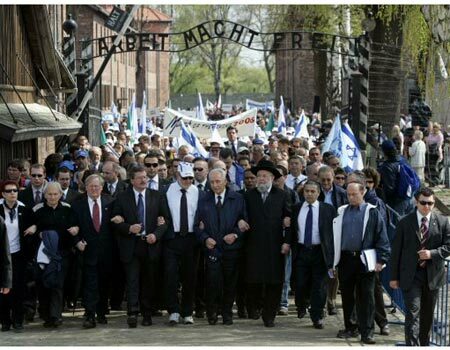 Israel’s designated Finance Minister Abraham Hirchson, Deputy Prime Minister Shimon Peres, Rabbi Yisrael Meir Lau, Holocaust survivors, and senior Polish government officials were all gathered near the entrance to Auschwitz, awaiting the start of the March of the Living, an annual two-kilometer (1.2 miles) walk to the Birkenau death camp. Hirchson, founder of the annual event, led the March. Slowly, elderly Holocaust survivors walked alongside him, unable to restrain their emotions. By the time the survivors, waving blue and white flags, assembled in the plaza near the gas chambers to the strains of a haunting Yiddish elegy, not a dry eye remained. No one disputes that the powerful and poignant March of the Living contributes greatly to Holocaust commemoration. However, allegations of financial irregularities have been raised. Behind the scenes, a complex network of Israeli and American non-profit groups, staffed with many Hirchson cronies, control millions of dollars of public funds and March participation fees. Convoluted money trails and partial reporting means that these millions are difficult to trace. In order to produce and manage the March of the Living, Hirchson set up three Israeli non-profits, two in 1987 and a third in 1989. Then MK Ehud Olmert was among the founders of one of these associations, but he announced his departure in 1992. All three groups were led by the same group of men: Hirchson, attorney Baruch Adler (one of Olmert’s law partners), and Ovadiah Cohen, past treasurer of the National Labor Union. In addition, Dr. Shmuel Rosenman and Aharon Tamir, both affiliated at one time or another with the Leumit Health Plan, were also involved. Four more non-profit groups were established in the United States. Until fairly recently, the website of one such association listed Hirchson as president and founder. Since then, Rosenman replaced him as president, but the site continues to refer to Hirchson as the founder. Hirchson’s attorney agreed that the Finance Minister established the Israeli non-profits but insisted that Hirchson was never involved with the American associations. The Israeli associations opened a joint office in Tel Aviv, and during the 1990’s, one of them began receiving funding from the Treasury, the Ministry of Education, the Jewish Agency, the United Israel Appeal, and the Zionist Organization. Reported expenses included salaries, administrative costs, public relations and more. Apparently, the above sources of public funding are not sufficient to cover the March of the Living’s costs, because North American participants are officially required to pay USD 3,300. In fact, some marchers reported that they ended up shelling out up to USD 5,500. Israeli participants pay less, but the fees are still exorbitant. All travel arrangements are made by two agencies: Gesher in Tel Aviv and Kesher in New York. Both travel agencies are run by Netanya city councilman Nachman Keidar. Sources close to Gesher indicate that Keidar is a friend of Hirchson’s crony Rosenman. Other agencies asked to participate in the project but were refused. In 2002, one of Hirchson’s Likud rivals filed a complaint with the Non-Profit Registrar that Hirchson was using the March of the Living’s offices for political activity. In the wake of the complaint, an inquiry was ordered, and Ilan Yaffe, an accountant, was appointed to lead the investigation. Yaffe discovered that the association had neither submitted financial reports nor transferred required protocols. As a result, the complaint could not be investigated. Following the report, the Non-Profit Registrar sent a warning to the association and transferred the case to the Income Tax Authority. Baruch Adler, the association’s legal advisor, vehemently denied any wrongdoing. According to him, the association was inactive, and therefore financial reports were not necessary. His subsequent request that the association be terminated was accepted, and the investigation was never completed. Later reports indicated that there may have been some truth to the original complaint, which, however, did not distinguish between the various non-profit associations affiliated with the March of the Living. All three associations operated from the same Tel Aviv office. Meanwhile, a long list of political activists and neighbors testified that Avraham Hirchson’s political campaign was headquartered at the exact same address in 1996, 1999, and 2002. Nevertheless, Hirchson refuted these allegations. “This claim is false and defamatory,” his attorney asserted. In 1995, the International Commission on Holocaust Era Insurance Claims (ICHEIC) began financing some commemorative activities. The March of the Living’s non-profit associations were approved to receive a portion of these funds. An investigation of these funds raises several unanswered questions. First, ICHEIC records indicate that 1.4 million dollars were transferred to “The International March of the Living – Tel Aviv”. The problem is that no such organization exists. “The International March of the Living” is the name of a New York based non-profit group, and, as noted above, the Israeli “March of the Living” association was terminated back in 2002. Moreover, the ICHEIC funds eventually reached the bank account of the non-profit “International Center for Jewish Heroism Studies” organization of New Jersey. Although the Center is legally permitted to use the name “March of the Living”, it does not operate out of Tel Aviv. Hirchson’s attorney explained that the New Jersey organization deals with fundraising, and the New York association focuses on operations. The ICHEIC added that the designation “The International March of the Living – Tel Aviv” referred to the fact that all March of the Living participants fly to Israel. Yet, one question still remains: What does the New Jersey association do with the ICHEIC funds it receives? According to the group’s 1997-2003 tax filings, the group’s main objective is to distribute stipends and collect money, which is then transferred to “March of the Living, Israel”. Needless to say, this only raises more difficulties. Why do the funds have to take such a torturous path on their way to Israel? Who received the money from New Jersey? Which organization is “March of the Living, Israel”? At the last March of the Living, the survivors effusively thanked the finance minister for his life’s work. Hirchson responded with warm smiles and handshakes. Perhaps the funds donated by Jewish organizations to the March of the Living did in fact reach their intended recipients. Yet, the bewildering network of non-profit associations and money transfers, together with officials’ refusal to specify where the money goes, raises a long series of questions. Israel’s Finance Minister, who is obligated to ensure total financial transparency, should provide the answers. See all talkbacks "Shoah march offices used for political activity? "